First discovered in the U.S. in 1877, Apatosaurus was once called Brontosaurus. This massive dinosaur grew up to 82 feet long and weighed as much as 50,000 pounds. It fueled its body by eating tons of plants every day. 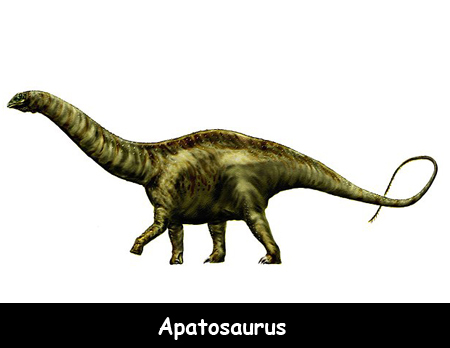 Apatosaurus lived during the late Jurassic period, about 152 million years ago. Its name means deceptive lizard because its bones resemble that of the Brontosaurus. Apatosaurus’s teeth were straight, like the prongs on a rake. The teeth stripped leaves from trees and plants, but were useless for breaking the plants into smaller pieces. The dinosaur swallowed his meals whole. Apatosaurus swallowed fist-sized rocks called gastroliths, which helped it digest its food. Many modern birds use the same method. Apatosaurus was slow but strong. One kick from it could kill a meat eater. Its front legs had one claw, while the back legs had three claws. It could probably rear up on its hind legs to defend itself or reach food. Because of their size and strength, healthy adult apatosauruses were rarely attacked by predators. These dinosaurs had long necks and tails. The tails could be used as a whip. The Apatosaurus had lightweight bones with air pockets in them, similar to birds. These bones made it possible for the animal to become huge without crushing itself under its own weight. Read more about the Apatosaurus. Declan, Tobin. " All Facts for Kids about Apatosaurus ." Easy Science for Kids, Apr 2019. Web. 21 Apr 2019. < https://easyscienceforkids.com/apatosaurus/ >.